This movie is an eye opener. I know a LOT about food. But this movie was talking about something I had never even really thought of... What would happen if some company patented all the seeds for our food? It is scary stuff, let me tell you. Basically the video takes you through the last 35 years of seed science. 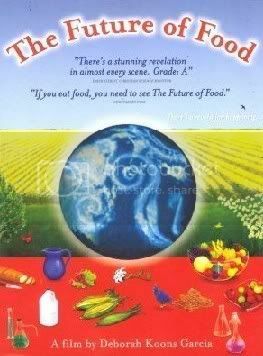 It talks about how seeds are germinated and the beginning of Genetically Modified seeds. It shows you actually farmers that were saving their seeds and using them to grow the next years crops all over the world. Mexico, Canada, and the United States especially. Then it explains about how GM seeds work, and how you can track GM seeds through their genes to find which farmer uses which brand and what pesticides that each selection is going to be able to withstand to make herbicide use very easy on farmers. Then it goes on to talk about how Monsanto has started suing the farmers that are close to areas where Monsanto seeds have been used because their crops have the Monsanto gene... but they never used Monsanto seed... their crops just happened to be pollinated by bees that flew in from Monsanto crop areas. Then they go on to interview everyone they can get their hands on that would have an opinion. Fascinating stuff, I tell you... scary and fascinating. What was the answer? Buy local, buy organic, grow your own when you can, save seeds, support people who grow their own and save seeds, support organic and local. Don said when the movie was over "Val, you like watching things that tell you you are doing it right." I had no idea that Don would be right, however. I honestly didn't really know what this movie was about except it concentrated on big agribusiness and Monsanto Seed Co and how they were evil and bad for the whole world. I think the worst of it, is you can't even see Monsanto on anything you buy in the store. They don't market under that name, they have a hundred different companies that market and package for them. It makes it that much more important to know where our seeds come from, to know where our food comes from, and to develop a real relationship with the people who grow it. As much as I love CA for the oranges and the tomatoes I am currently eating to stay healthy in the winter, I will be very happy to switch back to my local growers when the season changes. My husband and I saw this about a year ago and it really opened our eyes. I first heard about it one morning when I was listening to Dr. Oz interviewing Deborah Garcia (Jerry Garcia's widow) regarding the film. I agree with the importance of going local and supporting small community farms. I wish more people would read and learn about what's going around them. Like in Europe, they need to make it manditory to label whether or not the food contains GMO's. That way I can make the decision on what goes in my body instead of agricorporations. very interesting- i will definitely check it out. i can't begin to tell you what a thrill it is to feed our family from our own garden and farms of local folks that we know personally. we try to do so as often as possible and when we buy groceries we make the most responsible purchases possible. it certainly isn't cheaper to eat this way, but man is it worth it!